Please take a few minutes to complete this Health Survey for each dog that you own. The information you provide could be vitally important to the long term well being of your favourite breed. IMPORTANT: The information you supply will only be used as part of a statistical survey of the health of the Schnauzer breeds. 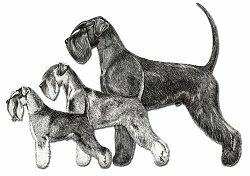 No detail of individual cases will be divulged to either the Schnauzer breed clubs or any other individual without your specific agreement. Feel free to also forward a link to this online survey for the owner(s) of any Schnauzer, Miniature Schnauzer or Giant Schnauzer you have bred, whether or not they are members of The Schnauzer Club of Great Britain, The Miniature Schnauzer Club, The Giant Schnauzer Club or The Northern Schnauzer Club. Please complete the survey separately for each individual dog.